← Brown Sugar Chocolate Cake with Chocolate Whip Frosting…. I just can’t believe it’s Thanksgiving time. This year is zooming by. Thanksgiving dinner is my most favorite meal to prepare. All of the family favorite dishes….the aroma of turkey in the oven…..mmmm-mm-m. Do you have a favorite Thanksgiving dish? I sure do. It’s the sweet potatoes. Ahhh, yes. I love them. Everyone has their favorite way to prepare them. I usually do something pretty simple, but I am bored with the family recipe. So, I am changing it up! This dish is delicious. It’s sinfully sweet and buttery. But remember, the calories don’t count at Thanksgiving! Right? The sauce that is mixed with the potatoes, is almost like caramel. I can’t even describe to you, just how rich and good this stuff is. Now, if you are not a fan of marshmallow, you could aways top this dish with a streusel topping. But seriously folks, the marshmallow…….YUM. Crispy, gooey, sticky sweetness. So good. Heat oven to 425. 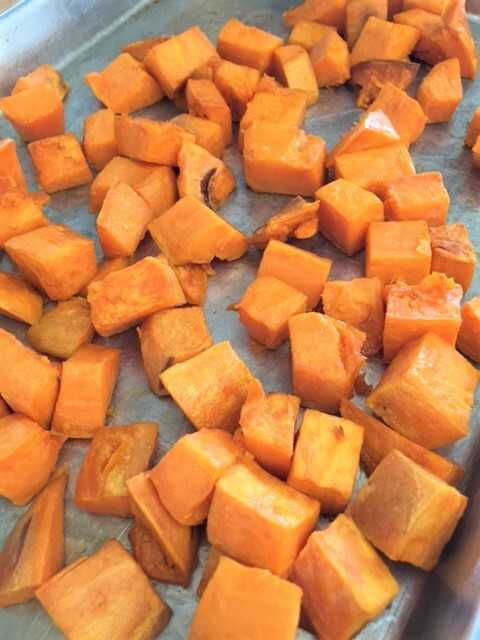 Peel and cut sweet potatoes into cubes. Put the cubes onto a baking sheet. Drizzle about 1 tablespoon of vegetable or olive oil over the cubes. Sprinkle with salt and stir the cubes around, coating them with the oil. Spread out the cubes on the baking sheet and roast them for approx. 20 minutes, just until they barely done. Remove from oven and reduce oven temp to 350. 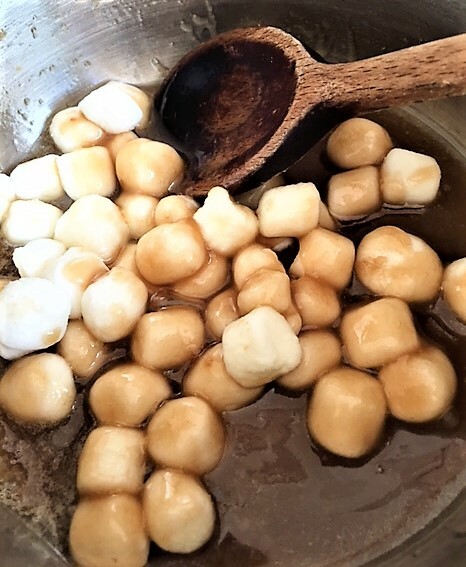 In a sauce pan, add the brown sugar, butter, marshmallows and corn syrup. Stir until marshmallows are melted. Set aside. Place the roasted potato cubes into a baking dish, or individual dishes. 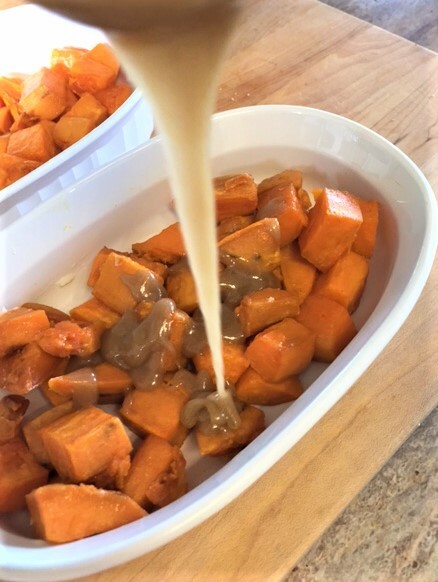 Pour the sauce over the sweet potatoes and give it a stir. 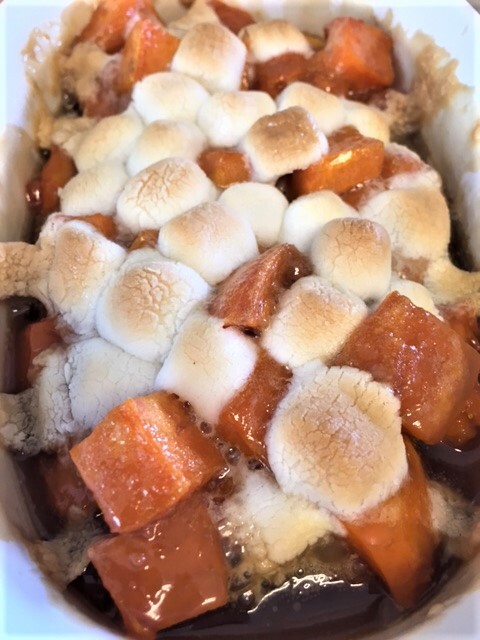 Top with marshmallows and bake at 350 for about 20 minutes or until the marshmallows are toasty brown.